With the help of the Los Angeles LGBT Center, National Coalition for Anti-Violence Programs, FORGE, The Northwest Network, Kaiser Permanente of Northern California, Casa de Esperanza – National Latin@ Network, Community United Against Violence (CUAV), Asian Pacific Islander Institute on Gender Based Violence, The Network/La Red, and the University of Pittsburgh, Futures Without Violence has developed new materials that are specifically for Lesbian, Gay, Bisexual, Queer and Trans/Gender-non-conforming people. 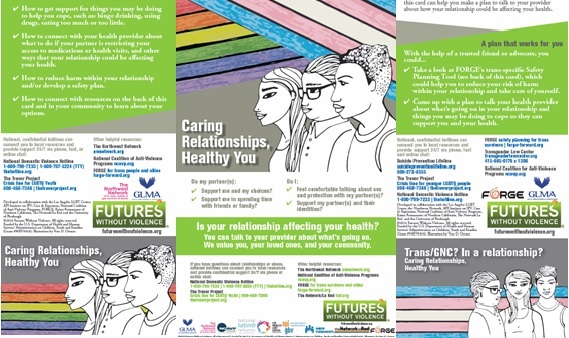 The Caring Relationships, Healthy You safety cards and poster are survivor-centered tools that are useful conversation starters for health care providers who are doing universal education around healthy relationships and assessing for intimate partner violence. Because queer and trans people experience violence at similar, and in some instances higher, rates as heterosexual people, it is critical that health care and other providers ensure that their practice is culturally inclusive for queer and trans people and that they are talking to all of their patients about the effects that intimate partner violence can have on health. Want more information about the serious long term health impacts of violence? Get the facts. Though it can be difficult for providers to talk to their patients about intimate partner violence, these safety cards can make the conversation easier! Give every patient two cards. This evidence based intervention showed that when patients were given two cards, they were more likely to share one with a friend or family member who needed it. “If you wanted to talk to me about things that are going on in your relationship, know that that is confidential, unless you tell me about an instance of child abuse or if you are going to hurt yourself or someone else.” (This will depend on state, see Compendium of State Statutes). Order more cards when you run out, for free from our online store. For additional information on how to use safety cards along with scripts and tips for responding to disclosures of violence, take a look at our primary care toolkit, training vignettes and this webinar. Learn more about the CUES intervention. Ask your for patients’ gender pronoun. Do not make assumptions about the gender of your patients’ partner(s), use gender neutral terms when referring to patients partner(s) such as “they”. Patients may not identify as LGBTQ or come out to you, but could still be engaged in non-heterosexual relationships and that’s okay! Include options other than Male and Female on intake forms. Familiarize yourself with local and national LGBTQ-specific resources and find out what services are available to male-identified survivors. The National LGBT Health Education Center provides educational programs, resources, and consultation to health care organizations with the goal of optimizing quality, cost-effective health care for lesbian, gay, bisexual, and transgender (LGBT) people. Interactive features like learning modules and webinars can also be found on the website. The Education Center is a part of The Fenway Institute, the research, training, and health policy division of Fenway Health, a Federally Qualified Health Center, and one of the world’s largest LGBT-focused health centers. The select resource and research in the National Online Resource Center on Violence Against Women (VAWANet) Special Collection illustrate the LGBTQ communities’ experiences with domestic violence within the U.S. Resources especially relevant to these individuals, as well as straight allies and professionals, address the issue of domestic violence in LGBTQ communities, relationships, and the impact on society. Guidance for enhancing culturally specific practice and policy initiatives is provided. Through safety planning, friends, family, advocates, and concerned professionals can help victims understand that these beliefs are dangerous myths and help the victim focus on where they/ze/he/she actually does have power and control: planning for and taking concrete actions that can enhance their/zir/his/her safety. Use this comprehensive planning too by FORGE to learn more about the issue and create an effective safety plan. Thank you to our partners and contributors! Los Angeles LGBT Center, the Northwest Network, FORGE, API Institute on IPV, Casa de Esperanza/National Latin@Network, National Coalition of Anti-Violence Programs, Kaiser Permanente of Northern California, The Network/La Red, the University of Pittsburgh, The Gay and Lesbian Medical Association, Community United Against Violence, Layal Camargo, Essex Lordes, and Vero D. Orozco.